TOKYO, Nov 6 2011 (IPS) - Hundreds of Japanese women have been converging on the Japanese capital demanding better relief for some 30,000 children exposed to nuclear radiation by the Fukushima meltdown. “Official recovery policy focuses on decontamination rather than protecting the health of those most vulnerable – children and pregnant women,” activist Aileen Mioko Smith told IPS. “Our meetings with officials to force faster evacuation programmes for high-risk groups are only met with promises to clear radioactive waste. This is totally irresponsible,” said Smith, who leads the non-government organisation (NGO) Green Action Japan. Smith criticised the government and the Tokyo Electric Power Company (TEPCO), operator of the crippled Fukushima nuclear plant, for focusing energies on defusing public tension by promising to reduce exposure in affected areas to below one millisieverts (a measure of radiation) per year. On Wednesday, TEPCO admitted that one of the Fukushima reactors showed presence of radioactive material from a burst of nuclear fission, indicating fresh leakage. 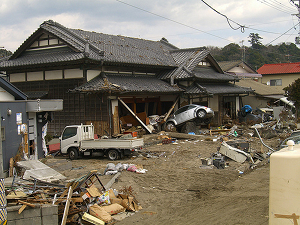 After the meltdown – caused by an earthquake and tsunami on Mar. 11 – the acceptable radiation standard for Fukushima residents was lowered to 20 millisieverts per year, and activists like Smith allege that this was done to minimise the number of evacuees. Smith said the new standards should, in any case, not have been applied to vulnerable sections such as children and pregnant women. Some 36,000 people have been evacuated from a 22-km radius of the plant while many more of Fukushima’s two million people may be affected, Smith said. “We will not give up till the government changes its callous attitude,” vowed Smith, participant in a women’s sit-in and protest before the ministry of economic trade and industry that determines Japan’s nuclear policy. The core of the protestors was made of about 200 women from Fukushima who sat on a three-day sit-in outside the Tokyo office of Japan’s ministry of economy. When that ended on Oct. 30, they appealed to women from all over Japan to join them for week-long protests until Sunday. Women from 47 prefectures have collected more than 6,000 signatures to support their demands. They have been handing out fliers to passers-by that contain detailed information on the dangers faced by the residents of Fukushima. Rika Mashiko, an evacuee from Fukushima, explained that she joined the protests along with her seven-year-old daughter to show solidarity and to express her disappointment with the government. Her husband continues working in Fukushima to maintain financial stability. Mashiko left her organic farm in Miharumachi, 50 km from the damaged nuclear reactor, six months ago. She resides in Tama, a Tokyo suburb and works part-time to support herself and her daughter. “I receive no financial support from the government because officially I left voluntarily – though I am a nuclear refugee. I do not trust the newly established standards for radioactive exposure in Fukushima and cannot risk the health of my young child,” she told IPS.. The women have linked post-disaster recovery with achieving stronger protection measures against radiation, transparency and honesty from government officials. They are pushing for a national pledge to end nuclear power generation in Japan. Ayako Ooga, a representative of the NGO ‘Fukushima Mothers Against Radiation,’ said the success of the government’s recovery programme is under test. Ooga fled on Mar. 11 from her home that fell within 10 km of the accident site. She explained to IPS that the high levels of radiation being reported from her area made it impossible for her to return. “We want an assurance that a similar accident will never happen again in Japan and that the government will do more to protect our friends and relatives from radiation,” she said. The women know they have a long battle ahead. A rude shock came on Nov. 1 when the Kyushu Electric Power Company announced that it would restart a faulty reactor at the Genkai nuclear power station in Saga prefecture, southwestern Japan. The announcement followed approvals from the government given on the basis that the company had taken sufficient measures after the reactor automatically shut down on Oct. 4, due to procedural errors in repair work. The plant is at the heart of a scandal following allegations that the utility had manipulated public opinion and pressurised employees to approve restart of the plant. Hatsumi Ishimaru, a farmer from Genkai who headed a campaign against the restarting of the plant, is among those who have came to Tokyo to join the women’s protest. Ishimaru, who is party to a lawsuit filed by the locals against the Genkai plant, told IPS that she will not rest until her farming village of 3,000 people is rid of the nuclear power generator. “Women are, today, at the forefront of the anti-nuclear campaign. We value life more than economic returns,” she said.